In the trauma center of Atlanta’s busiest hospital, Sara Linton treats the city’s poor, wounded, and unlucky—and finds refuge from the tragedy that rocked her life in rural Grant County. Then, in one instant, Sara is thrust into a frantic police investigation, coming face-to-face with a tall driven detective and his quiet female partner…. 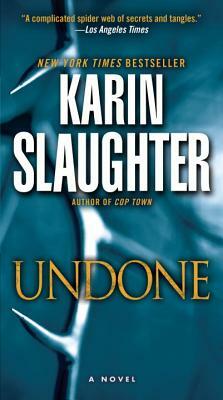 In Undone, three unforgettable characters from Karin Slaughter’s New York Times bestselling novels Faithless and Fractured collide for the first time, entering an electrifying race against the clock—and a duel with unspeakable human evil. Wresting the case away from the local police chief, Will and his partner, Faith Mitchell—a woman keeping explosive secrets of her own—are called into a related investigation. Another woman—a smart, upscale, independent young mother—has been snatched. For the two cops out on the hunt, for the doctor trying to bring her patient back to life, the truth hits like a hammer: the killer’s torture chamber has been found, but the killer is still at work. In her latest suspense masterpiece, Karin Slaughter weaves together the moving, powerful human stories of characters as real as they are complex and unforgettable. At the same time she has crafted a work of dazzling storytelling and spine-tingling mystery—as three people, each with their own wounds and their own secrets, are all that stands between a madman and his next crime. Karin Slaughter is the New York Times and #1 internationally bestselling author of numerous thrillers, including Cop Town, Unseen, Criminal, Fallen, Broken, Undone, Fractured, Beyond Reach, Triptych, Faithless, and the e-original short stories “Snatched” and “Busted.” She is a native of Georgia.